Jess and Hugo purchased their West London property in order to create their dream family home. The property had already been extensively extended including a rear extension and loft conversion with a large rear mansard dormer. The house is a classic Victorian terrace located in Shepherd's Bush in West London. The house maintained many of the original features including the original sash windows to the front facade. The house was in good condition but Jess and Hugo wanted to add their style and touch onto the property. 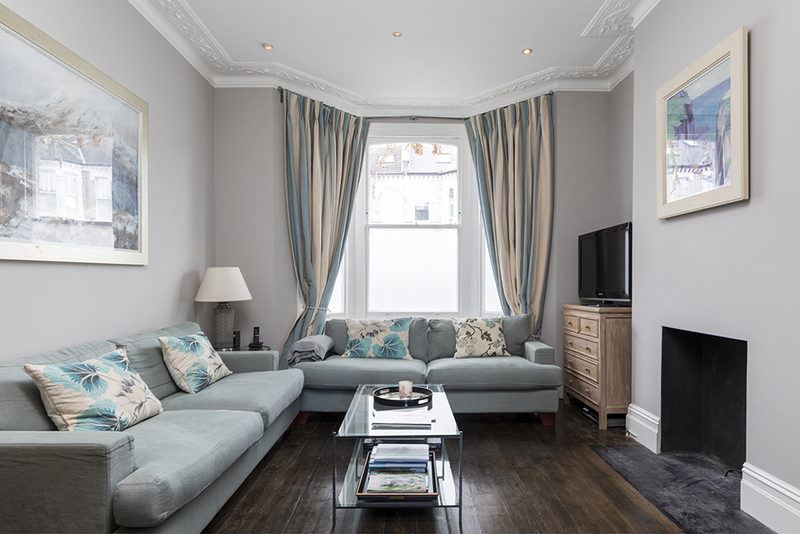 The aim of the renovation was to maintain the classical Victorian style of the property whilst introducing modern touches. Another key aspect of the brief was to maximise daylight throughout the property. The whole house was renovated including new flooring, decoration throughout, a new kitchen, bathroom and master ensuite. One of the key design features was the installation of crittal style black windows and doors to the rear ground floor. These open out onto the courtyard garden and add a contrast to the Victorian features of the property and the new shaker style kitchen. A key layout change to the first floor was the introduction of a walk-in wardrobe and ensuite to the master bedroom. To achieve this the middle bedroom was split to create the walk-in wardrobe and ensuite. The two rooms are then accessed off the master bedroom through a series of pocket doors that lay flush with the internal walls when opened. A new large family bathroom was created in keeping with the Victorian style. 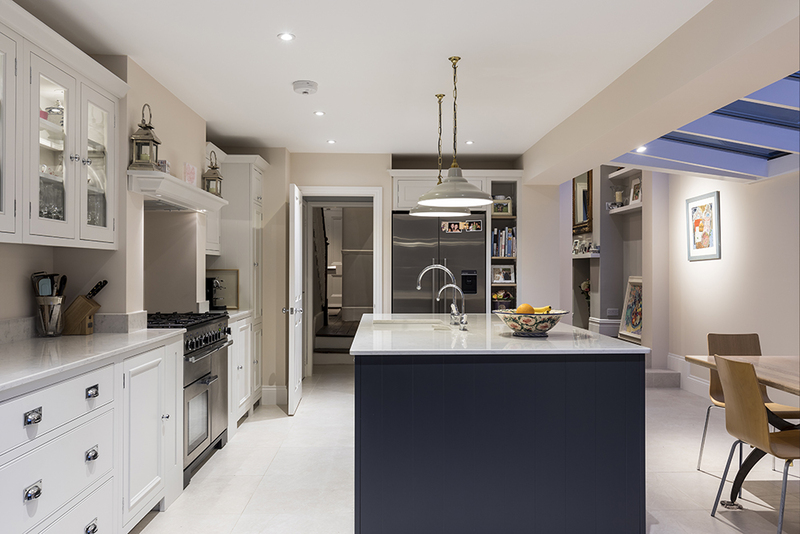 Jess and Hugo chose a Shaker Style Kitchen that centres around a large island located within the middle of the room. The kitchen layout is made up of a single run of kitchen units along one side of the open-plan space with a large central island. Natural light is flooded into the space through a full length glazed roof along the annex flank, large critical doors and fixed full height crittal window to the rear. The Shaker kitchen is made from painted solid timber consisting of Tulipwood and Plywood. The main run of units are painted in white whilst the central island is a striking dark teal blue. The units are square in frame with classical proportions with an inset panel. The worktop is a light granite with a double butler sink to the central island and a large gas range cooker to the main run of units. The range cooker was located within the alcove space of the chimney with a flush mounted extractor recessed in the space above. Two pendant lights have been placed above the central island to create a focal point, with simple lighting to the remaining area. The walls are painted in Middleton Pink with large Cavendish Cream porcelain tiles in a stacked format. 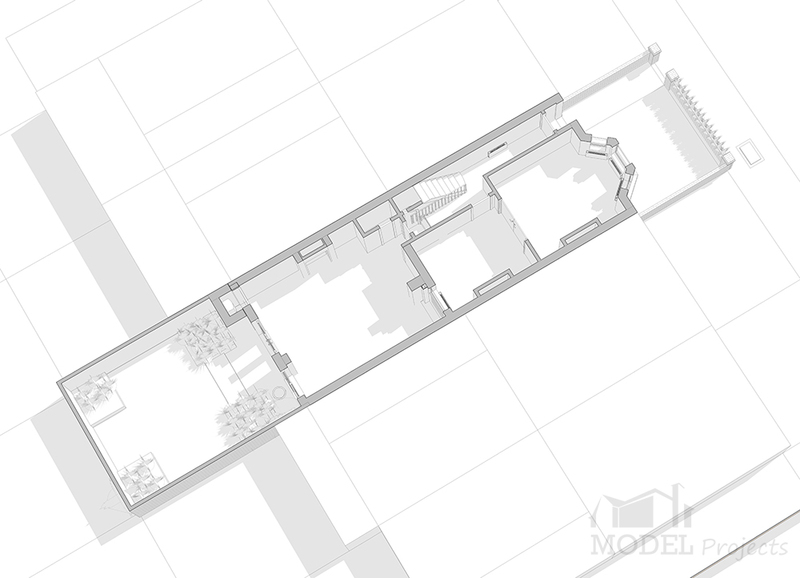 "My husband and I engaged Model Projects to manage our recent house renovations. We had bought a Victorian house in W12 which needed to be fully refurbished, including some structural amendments. I began working with Kathryn even before we purchased our house, as i was keen for her professional input during my property search. Having finally exchanged on our house we got to work immediately, in order that the builders could move in on day 1, following completion. Model Projects managed this entire process, including finding our builder (George) and his brilliant team. They created the drawings, applied for the permissions and managed all the additional services we need (engineer reviews etc). The process was seamless and i knew we were in capable hands as soon as i saw the Creation Pack. Kathryn and team were then on hand throughout the entire building work process and we are absolutely delighted by the finished product. Model projects were a pleasure to work with, as they were respectful of my ideas but also had plenty of their own. Not to mention there 'little black book' which meant absolutely anything was possible, as K and team always knew a vendor who could deliver on what i wanted, within my budget. I would highly recommend this firm to anyone and, in fact, we are about to start stage 2!" As the property had already been extensively extended the only requirement for planning was the change to the rear glazing. This was carried out through a Certificate of Lawfulness application under the properties Permitted Developments Rights.